Gramps Morgan, of Morgan Heritage, embarks on his solo career spreading his musical wings across genres, while remaining true to his Reggae roots. Gramps recently hooked up with neo-soul songstress India Arie on single "Therapy" from her upcoming album Testimony: Vol. 2, Love and Politics. JAMROCK Magazine Publisher, David "Squeeze" Annakie fully supports Gramps' creative journey. Mr. Annakie witnessed Gramps' stimulating performance with India Arie last night at her album release party at Kiss and Fly in New York City as they sang "Therapy". They harmonized beautifully on the upbeat contemporary R&B song and received exceptional crowd approval. The two singers are currently on a promotional press tour with multiple appearances nationwide; the most recently included a guest performance at S.O.B's with Kymani Marley. Gramps and India performed the first single "Wash The Tears" from his debut album Two Sides of My Heart. The single is now available on i-Tunes and the album is set to release later this year on Gramps' label Dada Son Entertainment. Gramps Morgan and India Arie have several upcoming media appearances that include Good Morning America Feb. 17, 2009 at 7:00am and a VH1 Soul performance Feb. 17, 2009 at 930pm. 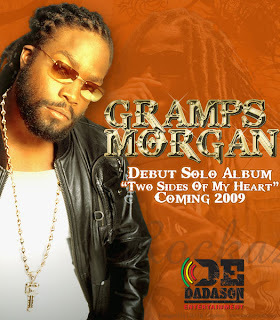 With a solid music fan base, much more can be expected from Gramps Morgan for the remainder of 2009. Fans can keep in touch with him through his Myspace. Visit www.myspace.com/grampsmusic for all updated information.